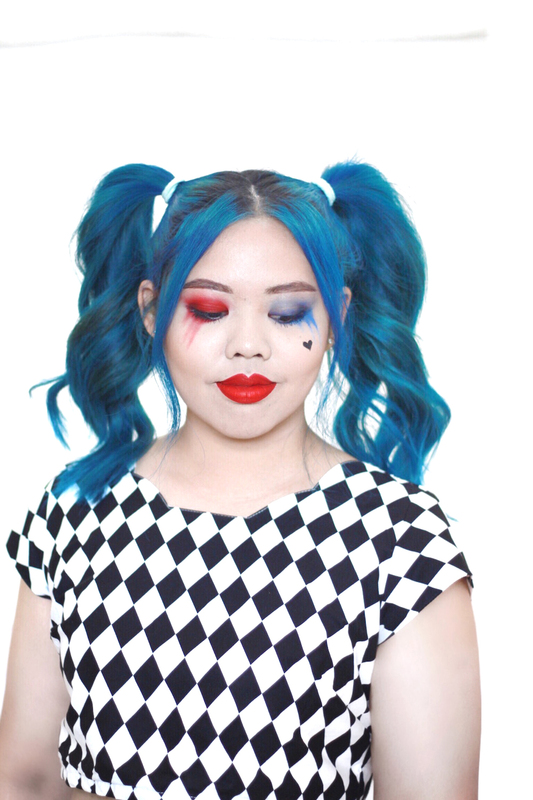 Seeing as the much anticipated Suicide Squad film was released worldwide this week, I thought it would be the perfect time to post this look. As you might have seen on my social media, I wore this get up to the last day of London Comic Con but it was totally impromptu. 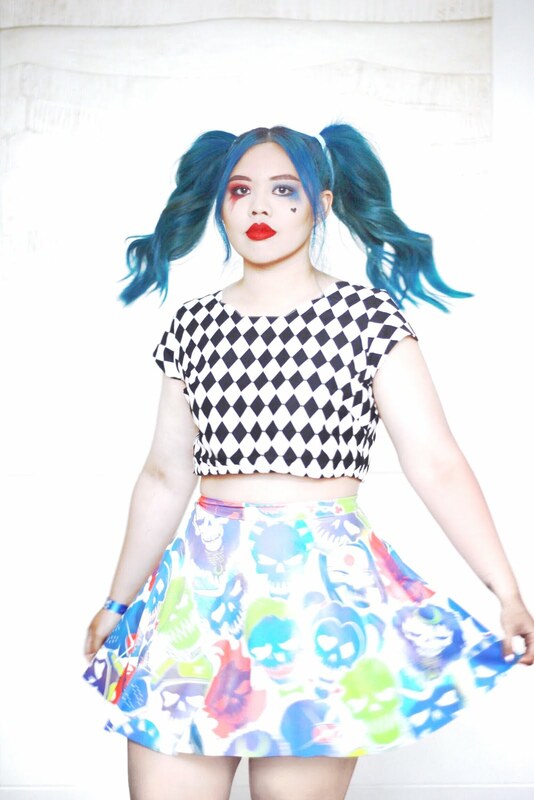 I hadn't planned on cosplaying but thought I'd still dress up and when I picked out my Suicide Squad print skirt from Black Milk, I decided to try out a Harley Quinn makeup look as well and pulled my locks into her signature pigtails as it was a handy do to disguise third day hair. 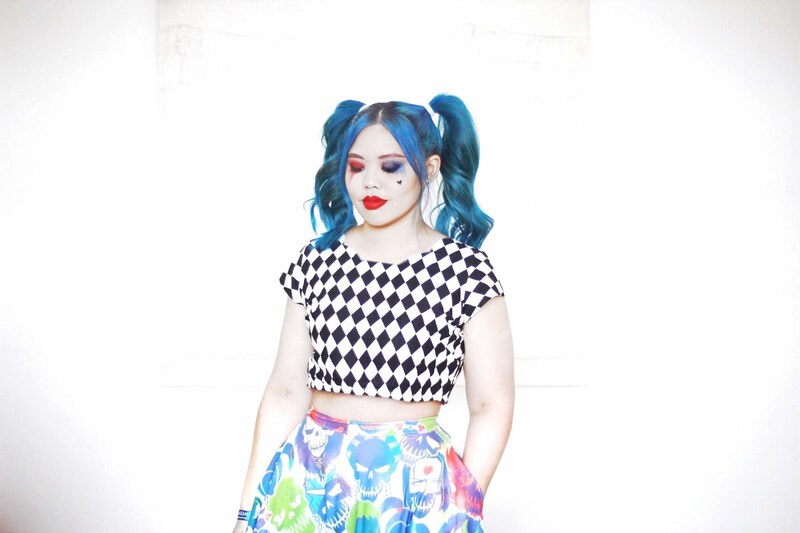 So it pretty much snowballed into an entire Harley inspired look when, instead of a plain black or white top that I had initially planned on wearing, I chose this diamond print top (part of a co-ord from Bonne Chance), which ended up being a nice nod to classic comic Harley. As for the makeup, I used a red and blue eyeshadow from the Limecrime Venus and Venus II palettes, messily applied it all over the lid, blended it out so it faded nicely from the crease and then smudged it down a lot lower on my bottom lash line. The smudge/drip effect was achieved using a tapered eyeshadow brush which I ran down towards the cheek in random lengths. The messier the better. I then smoked out the top lash line with black eyeshadow, skipping my usual liquid liner as I wanted a messier, grungier look. I used the liquid liner to draw on the little heart tattoo though. 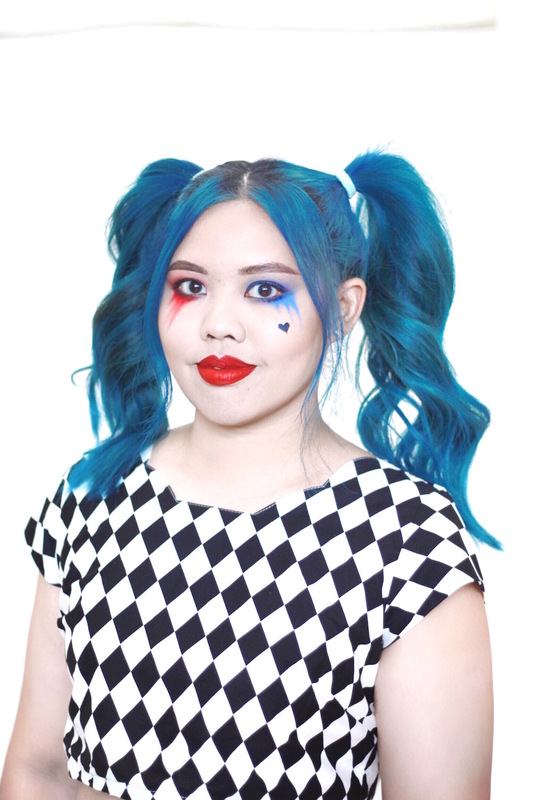 I decided to forego any blush to keep my complexion as pale as possible and finished off the look with some red lipstick courtesy of Jeffree Star Cosmetic's Redrum. 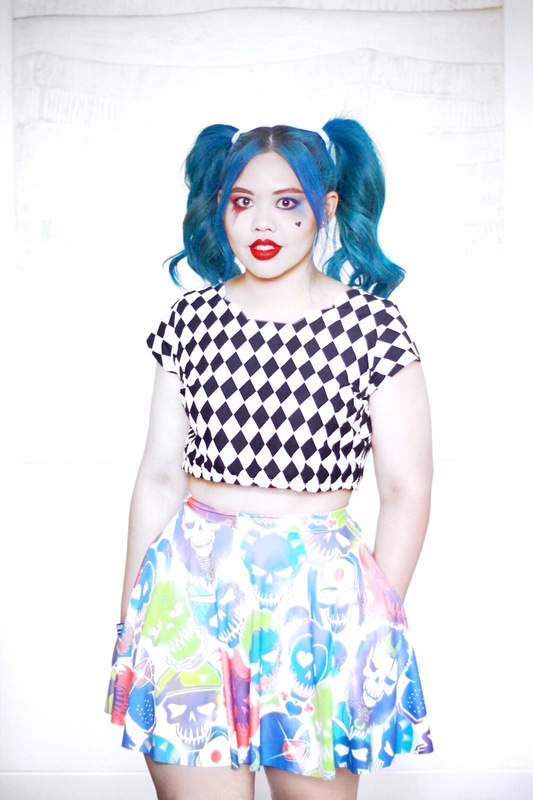 And that's what I like to call my 'Harley Quinn off-duty" look. I saw the film the day it came out and I must say I thoroughly enjoyed it, despite all the negative reviews I'd read previously. Sure it didn't have the most original storyline and the editing felt a little choppy (in saying that, I did live for the flashbacks) but I think if you go into it expecting a fun, entertaining, superhero flick, it hits all the right notes. Plus I've always found villains to be more interesting so Suicide Squad definitely had that going for me (I totally wouldn't mind seeing a Joker spin-off in the future). Oh and the soundtrack! Can we please just take a moment because it totally slayed! Have you seen Suicide Squad? What did you think?